Monaco had better watch out. The Singapore Grand Prix is fast becoming the 'big one' to be at if you are among the movers and shakers of Formula 1 teams and sponsors. It may not have its yachts in the harbour or such famous racing history, but the importance of the Asian markets, a night race spectacular that looks simply amazing, and being right on the doorstep of a great city, are all factors that are making it a no-brainer for the Singapore GP to be a must-attend event. That's why McLaren Group chief Ron Dennis opted to unveil his bold vision for the future of his company in Singapore; it's why FIA president Jean Todt chose to have a World Motor Sport Council meeting here; and why the likes of Richard Branson all ensure they leave the weekend free. But Singapore organisers do not just put on the race to please the business world, because this is an event that is big for fans too. And that means great entertainment. As well as the brilliant track action, the social programme was laid on thick and fast; with Rick Astley, Shakira, Boy George, Linkin Park and Shaggy all performing in concerts that took place over the weekend. 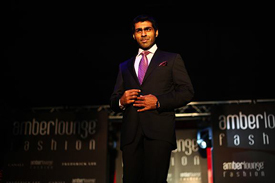 There was some high fashion on display as well, with the Amber Lounge Fashion Show once again proving a huge success. With Taio Cruz providing the musical backdrop, F1's test and reserve drivers including Karun Chandhok, Jules Bianchi and Sam Bird strutted their stuff on the catwalk. Formula 1 regulars have got well used to the sleeping tactic needed to get through the Singapore Grand Prix weekend – and it is one that involves zero jetlag. The night race timetable take place pretty much when events would happen at a European GP – which means for those who fly in, the easiest way is to simply stick to European time, if you can stomach going to bed at 6am and waking up after 2pm. Over the year a few of the restaurants and bars have cottoned on to the fact that there are hundreds of F1 personnel wandering the streets late at night trying to get food, and a regular routine has set in. However, the introduction of Formula 1's curfew this weekend hugely complicated matters – and led to some unprecedented scenes outside the paddock as queues of F1 personnel were left waiting in long queues to get in once the gates were open. As part of the move to drive down costs, a curfew has been imposed which effectively prohibits team personnel from being in the paddock for a six-hour period on Fridays and Saturday nights. This normally runs from midnight to 6am on a Friday and 1am to 7am on a Saturday. However, with the night timetable things got hugely complicated as the curfews ran to 3pm and 4pm on the two practice days. 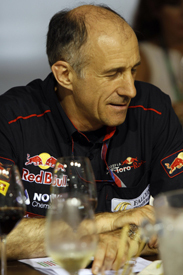 On Friday afternoon, as team personnel duly waited outside the paddock in the Singapore heat, Scuderia Toro Rosso team principal Franz Tost could not understand why everyone was milling around while there was work to do – so he swiped into the gates and headed for his office. Unbeknown to him, it was before the curfew had been lifted – which meant the team used up one of the four 'joker' free exemptions it is allowed over the course of the year. Of more significance the next day was when the Red Bull Racing, Mercedes GP and Virgin Racing teams turned up to find that marketing personnel – who had nothing to do with the cars – had entered the circuit early to look after guests, and broken the curfew! They too briefly were told that the breaches would cost them one of their jokers. Luckily for all three teams, a discussion with the FIA highlighted that the team representatives were not involved in the operation of the car, so the curfew punishments were lifted. Only in F1 could you ever get told off for turning up early! Of course the ingredients and flavours have come a long way since that famous Daley Thompson advert from the mid 1980s, and it was fascinating talking to Jenson Button and Lewis Hamilton early in the weekend about the implications of a deal that got people all nostalgic. Hamilton had a big smile because, in this brand dominated world, it meant he could now go out to the gym and not have to worry about taking labels off bottles of drinks. "It is pretty neat for us because in the past we weren't working with a drinks company and we had to disguise whatever drink we were having," he said. "We couldn't say if we were drinking Lucozade, and if were drinking Lucozade I couldn't carry the bottle around, so it is quite neat. And now I don't have to buy it – I can have a whole fridge full of it!" 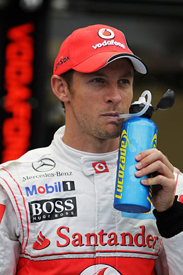 Lucozade reckoned the paddock managed to get through 1,800 bottles over the course of the weekend – although whether Lewis and Jenson were simply stockpiling their suitcases to load up their fridges at homes remains to be seen! If you follow Formula 1 closely, you will know that the sport likes nothing more than a good acronym. Over the years there have been a host of organisations that have become buzzwords of their own in the paddock – including FOM (Formula One Management), FOCA (Formula One Constructors' Association), FOTA (Formula One Teams' Association), and KERS (Kinetic Energy Recovery Systems). 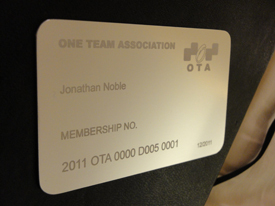 Now though, although perhaps not so well known yet, another organisation has appeared – OTA. HRT team principal Colin Kolles may be a pretty hard task master, but he is also someone who has a brilliant sense of humour too. So when his outfit left FOTA last year, he decided that he would have a bit of fun and create his own organisation – the One Team Association – for his friends, colleagues and anyone else in the paddock that he deems suitable. Over the course of the season Kolles has quietly attracted some pretty high profile members – whose identity cannot be revealed here – each of whom has had to apply to join, get their application approved and then receive the real benefit of membership: a nice shiny membership card! Sauber CEO Monisha Kaltenborn revealed at a press briefing on Thursday that she was an OTA member, while I too joined the ranks and was presented with my card ahead of the Singapore race. It's the latest must-have item for any F1 paddock regular!